Our research team member Arthur Lutz has recently been promoted to Dr Lutz after a successful PhD defence in Utrecht. This year’s EGU General Assembly has passed and we presented a number of topics in 4 different sessions. In a session with numerous outstanding talks on Mountain Climates on Wednesday, Joseph Shea presented initial results from an analysis of glaciological and hydrological sensitivities in modeling in the Hindukush Himalaya region. On Thursday, Walter Immerzeel opened the session on debris covered glaciers with a solicited talk, summarizing our recent efforts in quantifying mass changes on the debris covered glaciers. During the same row of talks Jakob Steiner looked at the spatial and temporal evolution of ice cliffs and lakes in the Langtang catchment in the recent decade. The round of talks was followed by a poster session with 20 submissions specifically on the topic of debris covered glaciers, underlining the increased attention the issue has received recently. Philip Kraaijenbrink presented his work on the monitoring of glaciers using unmanned aerial vehicles. Pascal Buri presented some progress on the distributed modeling of ice cliff backwasting in the catchment. Evan Miles provided insight into the temporal change of supraglacial lakes and how to extract this information from Landsat imagery. He also presented recent work on deriving surface roughness oft he glacier with photogrammetric analysis. The contribution to this session was rounded off by Pascal Egli’s work on deriving debris thickness from remotely sensed temperature data. Jakob Steiner also presented some insights from analysis of the development of a large alluvial fan in the Langtang catchment in a session on sediment transport in pro-glacial environments. The week ended with Tobias Bolch presenting Silvan Ragettli’s recent work on mass balance change in the Langtang catchment during the last decade. 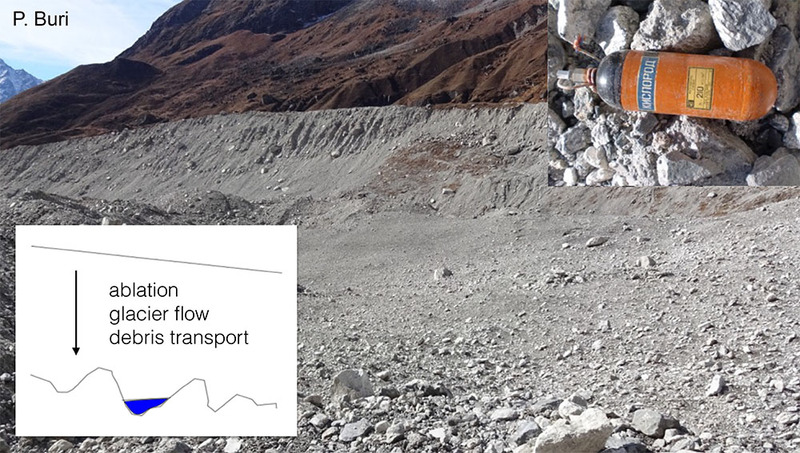 At the recent Alpine Glaciology Meeting (AGM) 2016 held in Munich we presented some of the ongoing work in the Langtang catchment. Pascal Egli presented his work on the reconstruction of debris thickness on debris covered glaciers from thermal satellite images and meteorological data via an energy balance approach. We used three previously published methods based on the energy balance to compute debris thickness maps of Lirung Glacier, assess their performance and determined their sensitivity to several input parameters. We developed a new time-integrating energy balance model with which we intend to obtain more accurate estimates of debris thickness by accounting for the heat transport and storage in the debris layer. Debris thickness reconstruction is essential for the determination of melt rates of debris covered glaciers in the Himalayas. 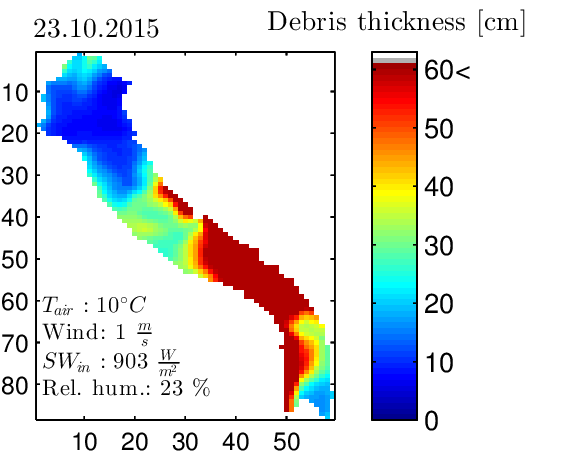 Figure 1: Modelled debris thickness on Lirung Glacier using an energy-balance approach, with distributed surface temperature data from a Landsat 8 image from 23rd October 2015. Pascal Buri presented a new 3D-modelling approach of ice cliff backwasting. Whereas some supraglacial cliffs remain stable in terms of shape over the melting season, some cliffs flatten considerably and disappear. We tested our physically-based model on selected cliffs on Lirung Glacier in order to simulate cliff evolution over one season. Both atmospheric melt and the interaction with adjacent lakes and debris slopes are implemented. This allows us to dynamically simulate the cliff geometry applying monthly geometric corrections. Simulated volume losses and melt rates for each cliff roughly agree with a TIN-approach used for validation but give also further insight into the inter-annual variability of melt processes and mechanisms behind cliff dynamics. 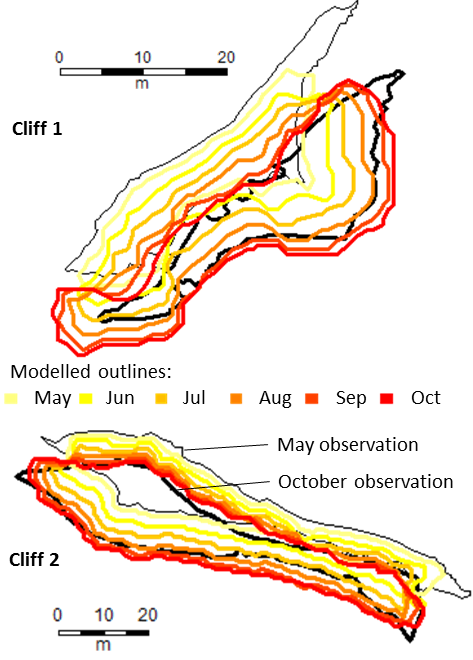 Figure 2: Simulated ice cliff outlines from May to October for cliffs 1-4. Observed outlines from UAV orthoimage in the background. Jakob Steiner talked about traces of the Gorkha earthquake from April 2015 left on the cryosphere in the catchment. We could observe that the ice released mainly came from the top ridges pointing at topographic amplification playing a possibly significant role in this case. This could help to assess which hanging ice seracs pose a danger in future earthquakes. The massive deposits on the glacier tongues of two debris covered glaciers in the catchment, could provide a chance to observe how the heterogeneous debris cover develops over time. Figure 3: The debris surface on Lirung glacier is nearly level on the upper parts after the earthquake. Observing how this surface changes into the hummocky terrain normally observed on such glaciers could provide insights into the general development of debris cover.